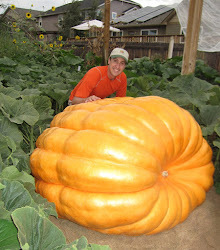 Giant Pumpkin Growing Tips From The Pumpkin Man: Lighting Up the "Grow Closet" & the Pumpkin Season has Begun! Lighting Up the "Grow Closet" & the Pumpkin Season has Begun! We are off and running! Seeds are soaking as we speak and the new "grow closet" is fired up. In the new house I put two closets in my office. The one closet is a typical office closet and the other closet is dedicated to pumpkins. I turned on all the lights for the first time today. The temperature is thermostatically controlled in the closet for the perfect environment. We should have enough lumens here to get some good pumpkin plants started.